Patriot IC00 SX Full-range instrument cable made with 100% U.S.A. parts and labor! Hand built in our custom shop with G&H 1/4" connectors including one Quiet Plug. 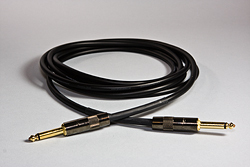 This is a great sounding cable for bass players and guitar players. We think you’ll love this cable for its great sound alone. But we went a step further and equipped it with G&H's Quiet Plug. The Quiet Plug goes into your guitar or bass and has a specially designed spring sleeve switch that turns the cable off when you unplug. No more putting your amp on standby when you swap one axe for another. Good stuff for sure!